HP Pavilion x2 10-k010nr (K3N12UA#ABA) is an ultra-portable 10.1-inch touchscreen detachable 2-in-1 laptop and tablet with a long 11.75-hour battery life, a quad core Intel Atom processor, 32GB Solid State Drive rather than a traditional hard drive, IPS display with large viewing angles and a decent range of connectivity options. 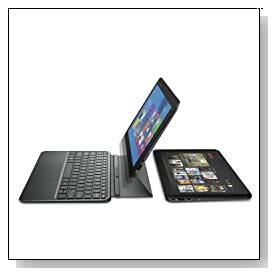 It is a completely functional Windows 8 machine that is suitable for both work and entertainment in two modes and it transforms between laptop and tablet modes quickly and conveniently with its innovative magnetic cover (plus a stand mode for presentations and video watching) with even a 12 month subscription of Office 365 while being very affordable. HP Pavilion X2 comes with the Intel Atom Z3736F quad core processor (2M L2 Cache) at 1.33-2.16 GHz speed for basic multimedia editing, web browsing, word processing etc., 2 GB DDR3L SDRAM memory for handling basic computer tasks and running a few browsers and apps simultaneously (not a multitasking beast but adequate at this budget level), 32 GB eMMC SSD for speed overall and fast boot-ups but still allows you to save quite a bit of photos and videos and Windows 8.1 operating system with Bing which the user can change to the search engine of their choice. The Z3736F processor is actually designed for tablets and with energy efficiency in mind and it includes the turbo boost function but no hyper-threading. 10.1 inch diagonal anti-glare HD WLED-backlit WXGA IPS touchscreen with 1280 x 800 pixels max resolution and Intel HD graphics (Bay Trail) means decent screen quality- it is not Full HD but has the IPS feature that offers larger viewing angles, is anti-glare and the graphics card lets you play the older games like World of Warcraft fluently at lower settings and not really the majority of newer titles and fair enough as you would not be buying this PC for advanced gaming purposes but more for performing your daily tasks (including general multimedia) in flexible laptop, tablet and stand modes- neither the Atom Z3736F CPU nor the Intel HD GPU will be fit for multimedia editing or 3D gaming. 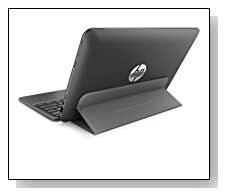 The HP Pavilion x2 comes with the stereo speakers for adequate sound performance and a frontal 720p webcam with built-in microphone to let you chat comfortably on Skype. Matte finish in ash silver with moonstone gray HP Pavilion X2 weighs 2.47 pounds with measurements of 6.69 x 10.39 x 0.38 inches ( and only 0.29 inch thick at the base) so it offers super portability with also its 10 inch screen. And it will feel comfortable to use with its integrated soft cover, adjustable stand (for the ideal viewing angles) and detachable keyboard in whatever mode you choose. The 2-cell lithium ion battery will give you up to 12 hours of battery life according to the manufacturer and this is not hard to believe considering the 35WHr battery is pretty good and the TDP- thermal design power of processor is only 2.2 watts. Keyboard is a 97% size island-style for comfortable typing- it is a proper, real, tactile keyboard without a 10-key numbed due to the size of machine but with a functional and responsive touchpad. It includes a good variety of modern connectivity options despite its slim chassis: Ethernet, 802.11abgn wireless, Bluetooth 4.0, 1 x USB 2.0 port, 1 x microUSB 2.0 port (great as most tablets only have a micro USB), 1 x Audio-out port, an SD memory card reader, 1 x headphone-out/microphone-in combo jack and an HDMI port. Conclusion: HP Pavilion X2 10-k010nr stays cool and works quietly even after hours of operation, thanks to its innovative fanless design- so none of the noisy hardware or whirring fans to keep them cool. It is nice to have a proper USB 2.0 port along with the microUSB so that you can recharge your battery and connect to a USB device. It is an Energy Star qualified machine and the battery life is reported to be 11 hours and 45 minutes in normal use so you can be out and about- away from power outlets all day long, it is super light and slim and will in any bag easily. Storage is just 32GB but is in SSD format not the slow HDD and you are encouraged to use Cloud based storage, given also the ultra portability of this machine- you get 25GB of storage for free for 6 months from Dropbox. It comes with 12 months of limited hardware warranty as well as 24/7 technical support via telephone or online chat in Spanish, French and English. It is a fully functional Windows 8.1 PC with a detachable keyboard and that transforms between different modes and is comfortable with the built-in soft cover. It offers great value for money despite not being a gaming or multimedia powerhouse, you’re getting more than what you pay for.